In 1913, there were nine junior sides playing hurling in the West Board: Spiddal, Barna, Liscannaun, Athenry, Annaghdown, Claddagh, Bohermore, Gráinne Ní Mháille (Galway city ), and Galway City Gaels. In August 1919, in a festival of hurling in South Park, Thomas Ashes defeated Claregalway by 4 – 7 to 5 - 2 in what was described as a wonderful match. The Ashes were primarily a city and Castlegar side but also included other Galway men. The same day, their juniors defeated Menlo Emmetts by 4 – 08 to 1 – 00. In 1919, players were often taking their lives in their hands by playing hurling, as the British suspected that the games were a cover up for Republican activities. Our photograph today shows the Thomas Ashe team who were the West Galway Champions in 1923. They won the title by beating Craughwell by four points in front of a large crowd in the Hospital Grounds in Ballinasloe. The team is, back row: Thomas Cooke, Moneenageisha; Tom Browne, St Bridget’s Terrace; Mick King, College Road; Martin King, Bohermore; Michael Feeney, St Bridget’s Place; “Stalky Fitz” (Fitzpatrick ), Bohermore; and Martin Crowe, Bohermore. 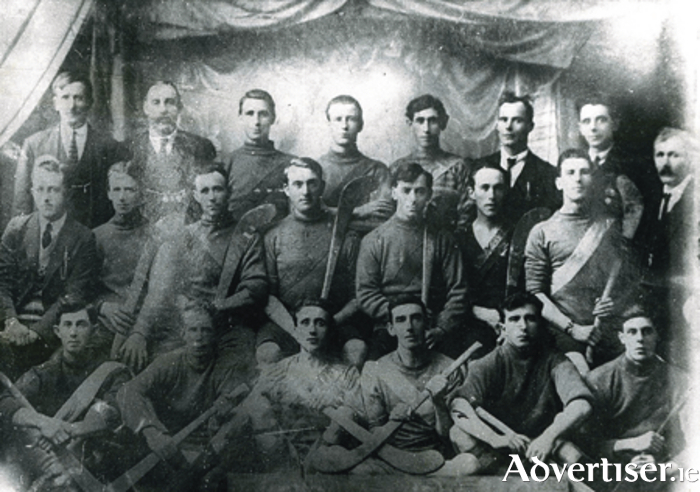 Middle row: Tim Lenihan; Paddy Hurney, The West; Bill Newell, Castlegar; Paddy O’Connor (captain ), Bohermore; Miko Cunningham, Abbeygate Street; Michael Duggan, Ballinfoile; Tom McHugh, Bohermore; and Sam Simon. In front are: Peter Casserly, Grealishtown; Tom King (a brother of Mick’s ), College Road; Martin Beatty, Henry Street; Johnny Lynskey, Bohermore; Josie (Waller ) Kelly, St Bridget’s Terrace; and John P Browne (son of Tom in the back row ), Henry Street. All of the above are from a catalogue of an exhibition that takes place during Heritage Week in the Workhouse in Portumna from August 24 to 28. The subject is Galway club hurling, the early years, 1884 – 1934, and it consists of news clippings, match reports, and photographs and it has been compiled by Steve Dolan with lots of TLC. It opens from 9.30am to 5pm and admission is free, and the public are invited to bring along any old club team photographs they might have so that they can be scanned. It is a fascinating collection particularly for anyone interested in Galway hurling. Very highly recommended.